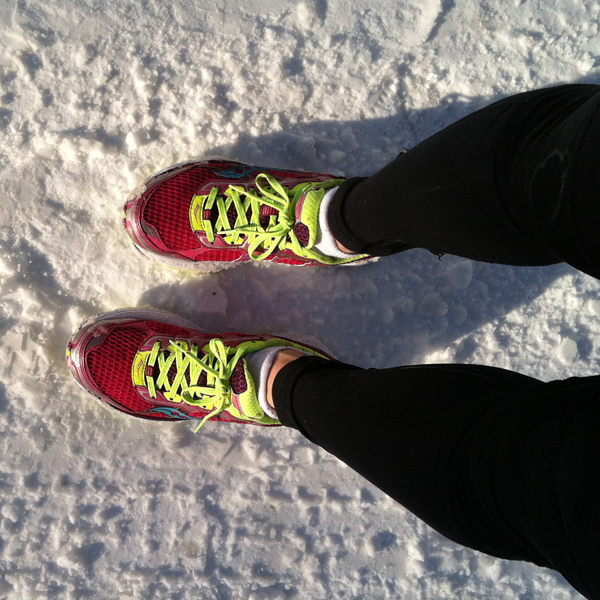 These are the shoes I ran 14 miles in the day after a major blizzard this winter in Boston. The dedication, motivation, and sheer determination required to train for a marathon doesn’t compare to any other event. To train in a Boston winter takes training for a marathon to another level. While my family thought I was crazy for going out on the snowy Boston roads to run 14 miles in 30 degree weather, I was focused on the feeling of finishing the Boston Marathon in my Dana Farber Marathon Challenge singlet and the sheer exhilaration of that moment. This kept me going on all the cold, long training runs. The combination of completing my first marathon and raising such important funds for cancer research for the institution I have worked at for more than six years was going to be one of the greatest moments of my life but, that was cut short as I wasn’t able to cross the finish line. I was able to get to mile 25.8 and, for that, I feel a great sense of accomplishment but there is definitely something missing. The range of emotions from being on such a high from running my first marathon, the spectators cheering me on throughout the entire course, the scream tunnel combined with the sadness of the day, horrific tragedy, and then fear during the lock-down on Friday, April 19, is all hard to work through and comprehend. How can the excitement of running the Boston Marathon be coupled with such sadness? In the end, it will make me stronger and I will run harder in the 2014 Boston Marathon on the Dana-Farber Marathon Challenge team.